At 8:15 on the morning of 23 January 1960, Jacques Piccard and Lieutenant Don Walsh, US Navy, climbed into the pressure sphere of the bathyscaphe Trieste, and sealed the hatch. Less than ten minutes later, they were descending towards the floor of the Pacific Ocean, towards the floor of the deepest part of the Pacific Ocean: Challenger Deep. Challenger Deep is 35,994 feet (10,971 metres) deep. If you put Mount Everest in it, there would still be a mile of water above the mountain’s peak. It is a slot-shaped depression, about one mile wide by four miles long, in the floor of the Mariana Trench. There have been only three descents to Challenger Deep. The Trieste‘s was the first, and the only one to carry human beings. Two remotely operated vehicles have also been there: Kaikō in 1995 and Nereus in 2009. Given conditions on the floor of the Mariana Trench, this is hardly surprising. Down there in the hadal zone, the pressure is close to seven tons per square inch, the temperature is around two degrees Centigrade, and light itself cannot reach. Yet there are creatures living there. 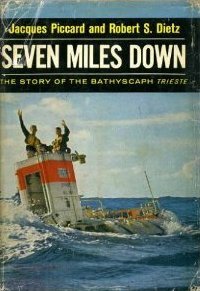 Seven Miles Down by Jacques Piccard and Robert S Dietz is the only book written specifically about the Trieste and its descent into Challenger Deep. The Trieste was invented by Piccard’s father, Swiss professor Auguste Piccard, who was apparently the inspiration for Hergé’s Professor Calculus. Piccard senior was one of those scientist-inventors who no longer seem to exist. In the 1930s, he built a balloon with a pressurised gondola, and ascended into the stratosphere, the first person to ever do so. A decade later, he turned his attention in the opposite direction, and invented the bathyscaphe, or “deep boat”, in order to study the depths of the ocean. It operates much as a balloon does, although using gasoline, which is lighter than water, rather than air. 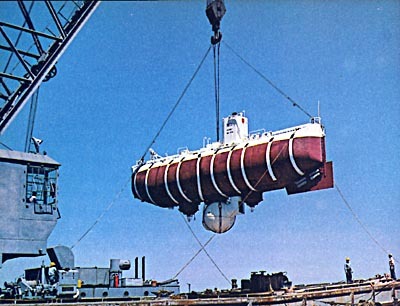 His first such vessel was the FNRS-2, named for the Belgian Fonds National de la Recherche Scientifique, which financed its construction and early operations. It was later sold to the French Navy, who upgraded it to the FNRS-3. The Trieste, however, was privately funded. … at which point I discovered that there’d been very little written about the descent. Last year was the fortieth anniversary of the Apollo 11 Moon landings and a number of books were published to celebrate it. This year was the fiftieth anniversary of the Trieste‘s descent and there’s been… nothing. In fact, the only things I could find proved to be contemporary with it: an article from Life magazine written by Walsh (see here), and Seven Miles Down by Jacques Piccard and Robert S Dietz. And the latter has apparently never been reprinted since. The book is actually more a history of the Trieste, and Piccard’s involvement with it, than it is a blow-by-blow account of the descent to Challenger Deep. The opening chapters cover the FNRS-2 and -3, the difficult time Piccard senior making his dream of a bathyscaphe reality, and the early dives. There is mention of Otis Barton and William Beebe, who invented the bathysphere and pioneered direct study of the deep ocean using a submersible. About halfway through the book, Dietz joins the story. An oceanographer attached to the US Navy’s Office of Navy Research and based in London, he helped persuade the US Navy to buy the Trieste and put Jacques Piccard under contract. During the second half of the 1950s, the Trieste made some thirty-five descents, piloted by Piccard and carrying scientists as observers. These were initially in the Mediterranean, and later off the coast of California. It was not until 1959 that a request was made of the Chief of Naval Operations to authorise “bathyscaphe (Trieste) operations (Project NEKTON) in the Mariana Trench, between November 1959 and February 1960”. Permission was given, a new and stronger pressure sphere was ordered from Krupps of Germany, and once that was fitted the Trieste was shipped from her base of operations in San Diego to Guam. She made six descents to various depths in the South Pacific before Piccard and Walsh made their record-breaking dive to Challenger Deep. Much of Seven Miles Down is written from Jacques Piccard’s point of view, although he does hand over the narrative at various points to Dietz. The prose is workmanlike but readable. Piccard maintains a nice balance between technical detail and his own impressions and experiences. It makes for an interesting read, although the prose doesn’t really come alive until the chapter on the descent to Challenger Deep. 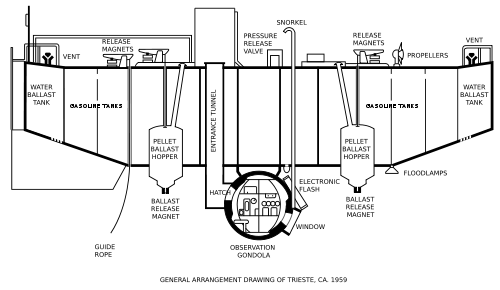 The technology involved is perhaps not as fascinating, and nowhere near as complex, as that in the Apollo programme, but the descents were every bit as dangerous – in Challenger Deep, there were 200,000 tons of water pressing on the Trieste‘s pressure sphere, for example. If Piccard had miscalculated the amount of gasoline needed in the float, or iron shot used as ballast, the bathyscaphe might never have returned to the surface. In fact, they were very lucky: during the descent, Piccard and Walsh heard something explode but could not work out what it was (on previous dives lights, a camera, and stanchions had all imploded). It was only during the ascent that Walsh spotted that the window at the rear of the antechamber had cracked. If it gave way, they could not clear the water from the antechamber and entrance tunnel and so would be unable to exit the sphere. They’d have to remain inside it for the five-day journey back to Guam and dry dock. Fortunately, the window didn’t break. An appendix gives the technical specifications of the Trieste, and lists all sixty-five dives made by the bathyscaphe between 1953 and 1960. After the descent to Challenger Deep, the Trieste returned to San Diego but did not dive again. In 1963, she was modified and then used to search for the missing submarine, USS Thresher. She underwent numerous modifications and upgrades over the years before eventually being retired in 1980. She now resides at the National Museum of the US Navy in Washington DC. Categories: bathypunk, book review | Permalink.